Quizzing is a huge part of e-learning course development, because you want to know if learners have understood the material. That makes sense! But that doesn’t mean your quizzes have to be boring. 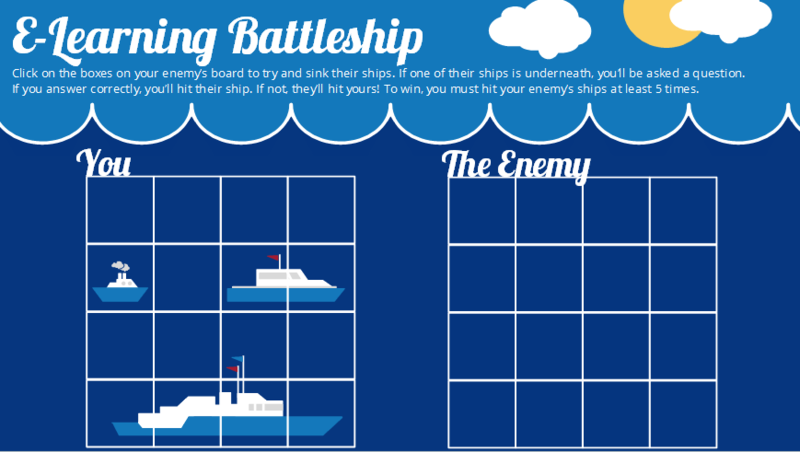 Take this e-learning battleship game, for example. When you strip away the game elements, it’s just a simple quiz. But to your learners, the game elements can mean the difference between a snoozefest and a fun and meaningful learning experience! In this article, I’ll show you how I built this from A to Z. Don’t be put off by the number of steps—it’s a lot easier than it looks. 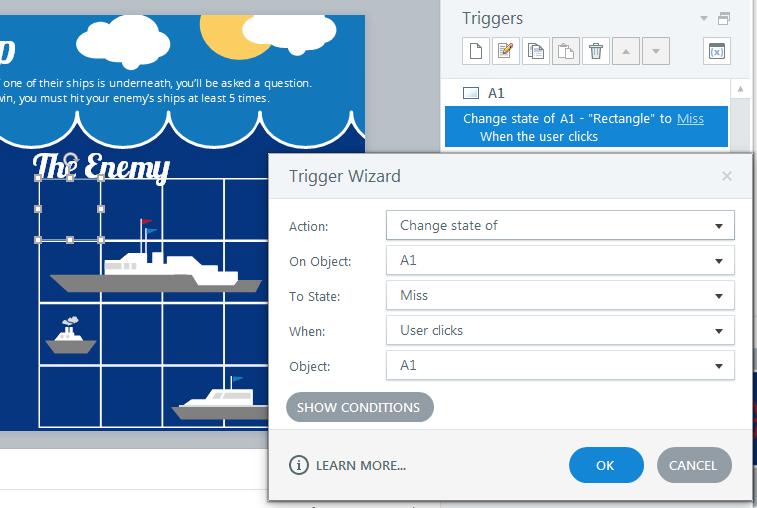 If you’ve been wanting to give e-learning games a go, but have been too intimidated by triggers and variables, this step-by-step tutorial is the perfect jumping-off point. The detailed explanations and screenshots will ensure you get it right the first time. Here we go! First, you’ll create your gameboard. To do this, just insert the number of squares needed using the “insert shapes” feature, and arrange them in a grid. The squares on the left (in the learner’s grid) should have no fill color. The squares on the right (in the enemy’s grid) should have the same fill color as the slide background. I’ll explain why later on in this article. Before moving on, you should create a naming convention for your squares. This will make the rest of the process much easier. 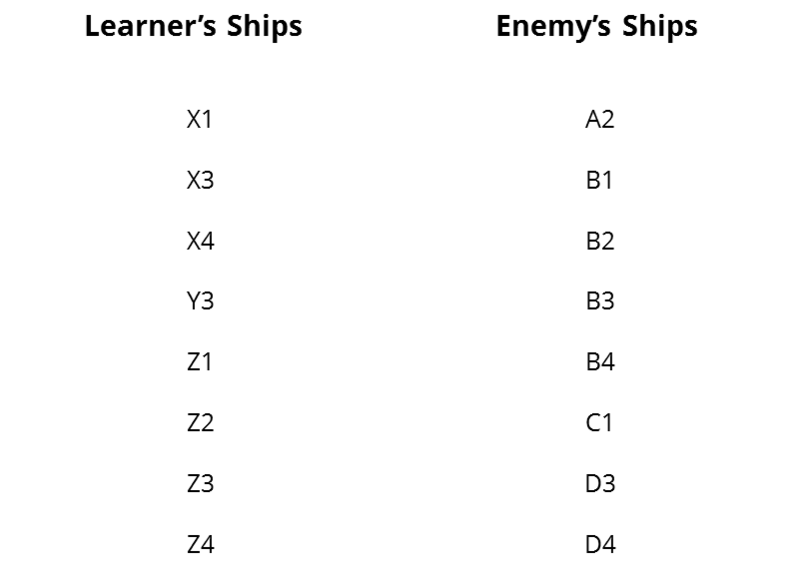 In this example, I’ve given each row a letter and each column a number, as pictured below. The left grid squares are named as follows (from left to right and top to bottom): W1, W2, W3, W4, X1, X2, and so on. 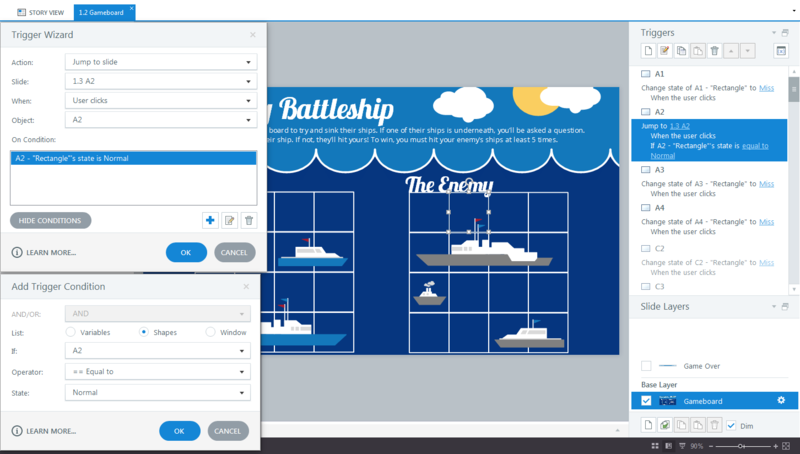 Next, design your ships using a combination of shapes, or insert them as images. 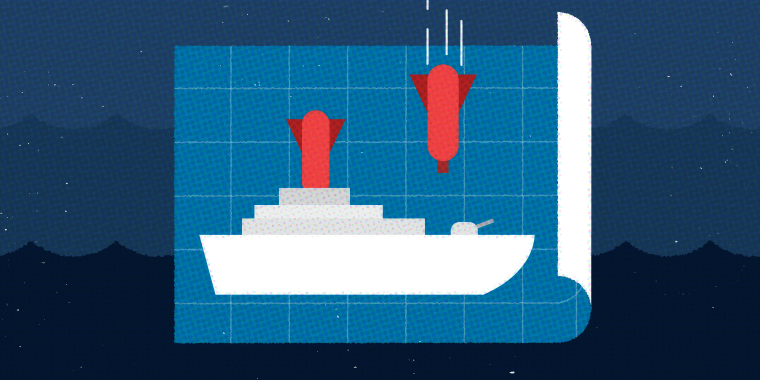 The number and size of your ships depends on how many quiz questions you’d like to include. Each player should have the same number of ships and squares overlapped. (In my example, each player has three ships that span eight squares, so I have eight total questions.) Then place your ships on the grids as desired. 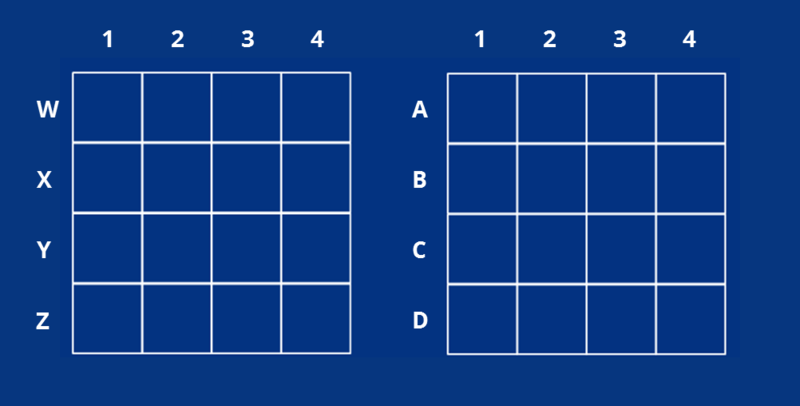 When the learner clicks on these squares, they will be brought to the corresponding question slide. We’ll use this list later, so keep it handy! Now that your player grids are set up, it’s time to add states to your squares. These serve as visual cues to the learners about how they’re doing. 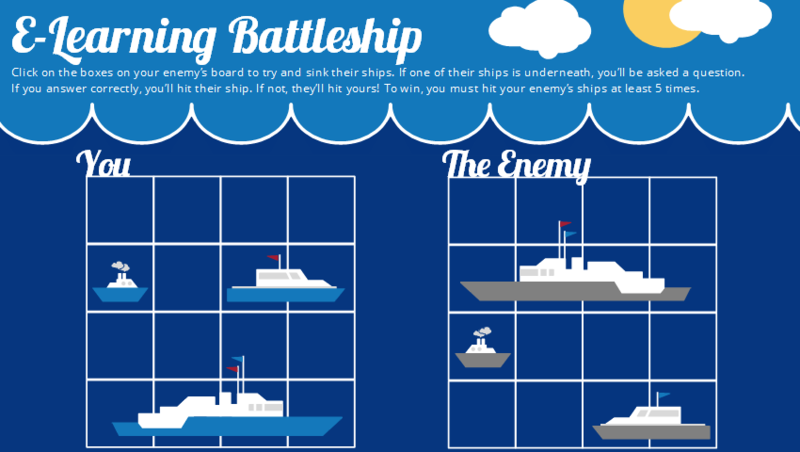 The real Battleship game offers only two possibilities: players either hit or miss their enemy’s ships. 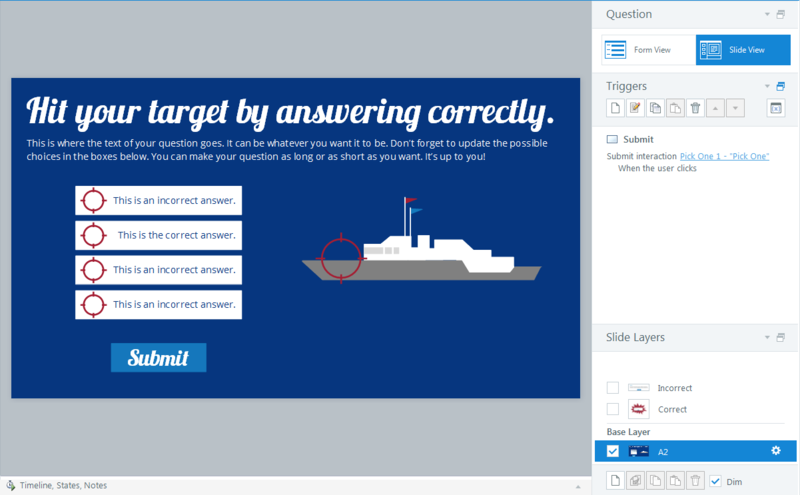 For the e-learning version, I created this third option: If learners find the ship but get the corresponding question wrong, they don’t get the points. For each square I created custom states named hit (correct answer), miss (no ship is present), and misfire (incorrect answer). If you’re not sure how to add states to an object, check out this tutorial before moving on. Since the squares in the learner’s grid are transparent and the squares in the enemy’s grid have a fill color, the states look slightly different. To add this trigger to all of the other empty squares on the enemy’s grid, simply select the trigger, click Copy Trigger, select all of the other empty squares, and choose Paste Trigger. It’s that easy! These variables will allow us to change the state of the squares on the player grids to hit or misfire, depending on the learner’s answers. We’ll see how in Step 5. The next step is to create your first quiz slide. I chose to create a freeform pick-one question, but you can use any kind of question you’d like. Use the same name for your quiz slide as for the corresponding square. 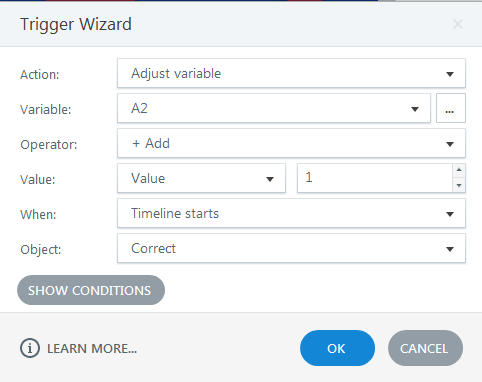 You’ll also want to change the “jump to” trigger on the continue button so when your learner clicks on it, they go back to the gameboard instead of to the next slide. Don’t forget to change the “jump to” trigger on the incorrect layer as well, so learners go back to the gameboard when they click Continue. 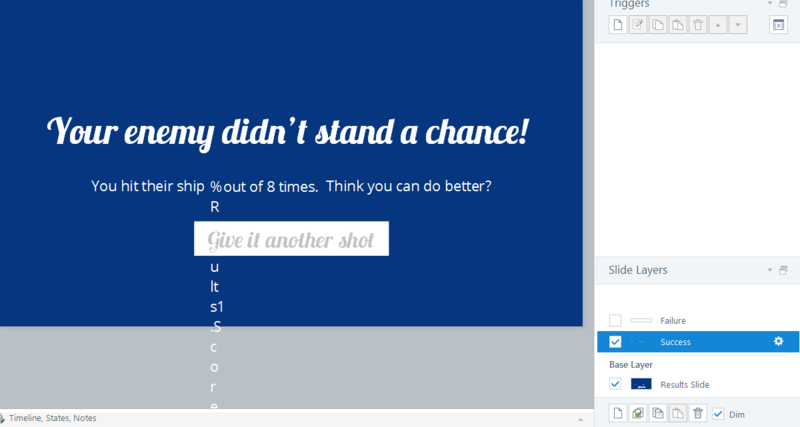 Now that you’ve created one quiz slide, you can duplicate it for all of your other questions, assuming you’re using the same question type. 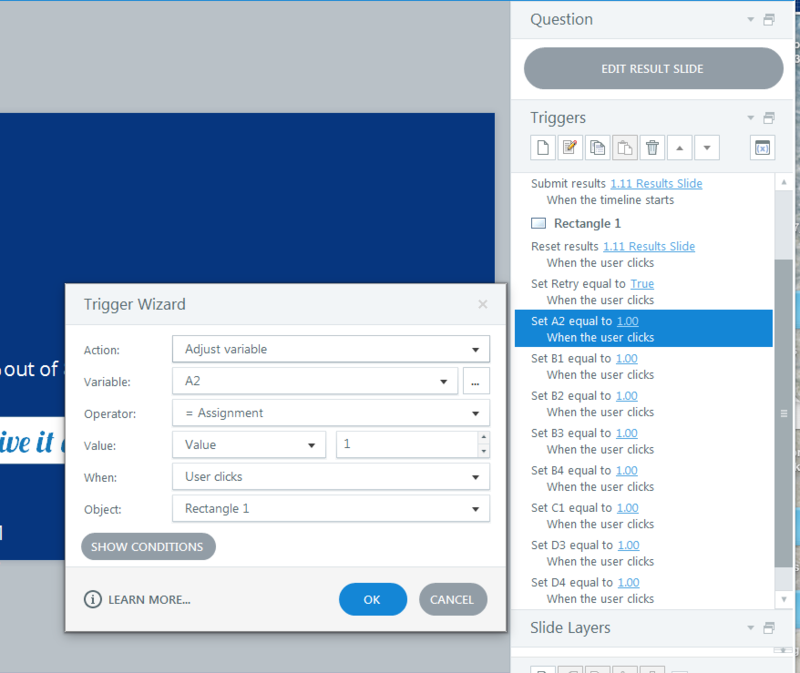 Once you’ve duplicated the question slides, change the titles so they match the names of the different squares, then change the variable referenced in the trigger on both the correct and incorrect slides using the drop-down menu. Once you’ve done that for all of your question slides, you’re ready for Step 7! 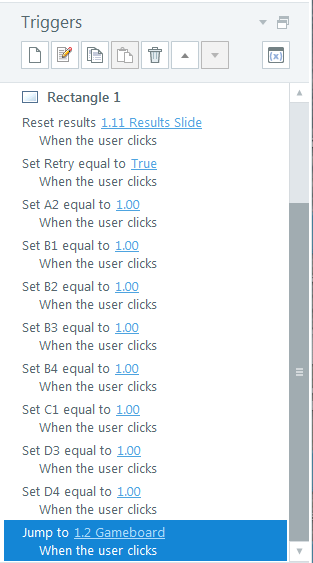 Remember, you can use the trigger copy/paste buttons to get this done faster. Just make sure to change the slide reference so the button leads to the correct question. 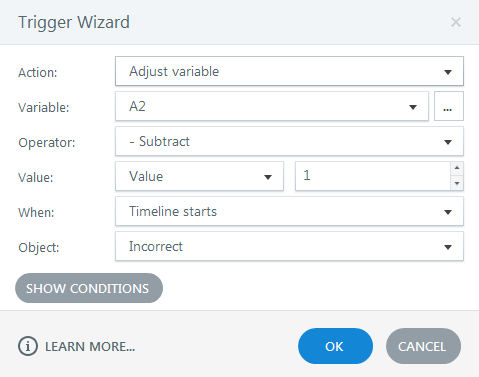 The first slide trigger will adjust the state of the square to misfire when the timeline starts if the value of the associated variable is equal to 0, as pictured below. This trigger will ensure that when a learner responds incorrectly, they will see the crosshair icon we created earlier. 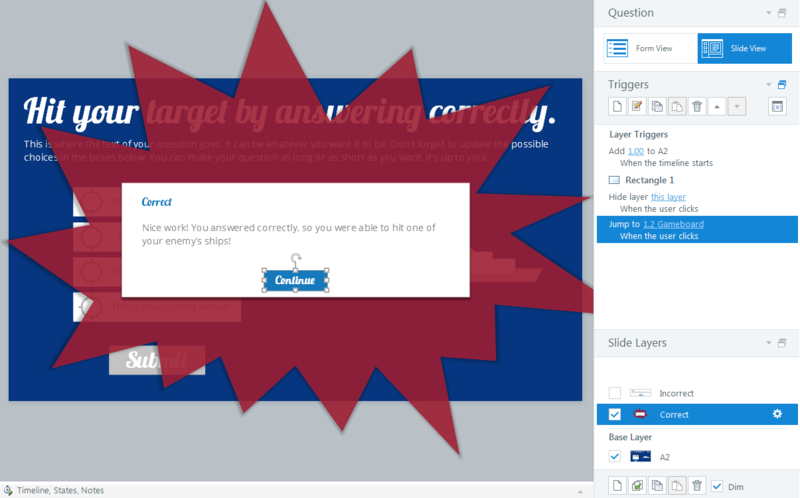 This next slide trigger will do the opposite: show the explosion icon when the learner responds correctly. It’s set up in almost exactly the same way, but this time you’ll have it adjust the state of the square to hit when the timeline starts if the value of the associated variable is equal to 2, as you can see below. Once I decided which squares to link, I duplicated the first slide trigger and changed the state to misfire, changed the object reference from A2 to X3, and changed the state to hit, as you can see in the screenshot below. Now when the learner answers incorrectly, they’ll see a crosshair on one of their enemy’s ships and an explosion on one of their ships. Phew! Your gameboard is set up. Time to select all of the ships, then right-click and select Send to Back to ensure that the states on the squares appear on top of the ships instead of underneath them. Since the squares on the learner’s grid are transparent, they can still see their ships, while the enemy squares have a fill, so their ships are hidden until the learner uncovers them. Last but not least, change the slide properties to "resume saved state" so that when the learner comes back to the gameboard after answering a question, the state changes remain intact. Next, insert a graded results slide. Make sure all of the questions in your project are selected and adjust the passing score. For my quiz, I chose 62% because I wanted the learner to have to get five out of eight questions correct to pass. For my results slide, I unchecked the “show passing score” and “review quiz” options and selected the “retry quiz” option. 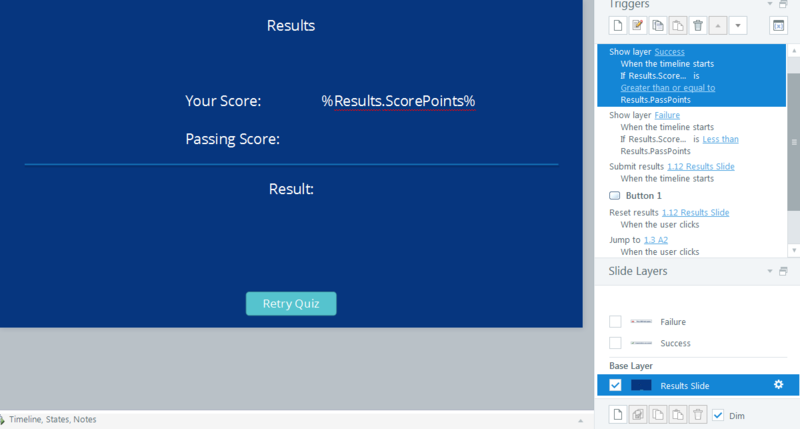 I only wanted the points to show, not the percentage, so I deleted the score percent variable reference, leaving only the score points variable reference. Then I deleted all of the text labels on the base layer and the success layers, inserted my own, and adjusted the layout. Then I created a true/false variable with a default value of false; this allows me to reset my gameboard if the learner wants to try again. 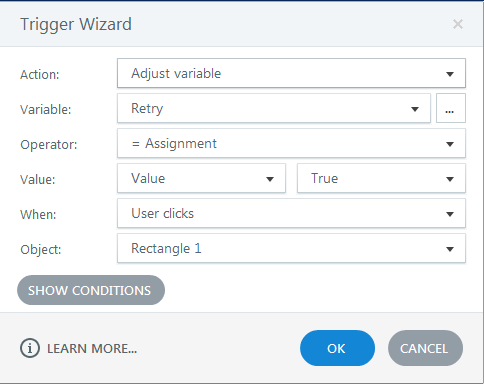 I then added a trigger to the retry button to change the value of this variable to true when the user clicks. I also added a trigger to reset the value of each of the other custom variables to 1, so that the states on my gameboard squares will work as they did the first time around. Remember, you can use the copy/paste trigger icon to do this more quickly. 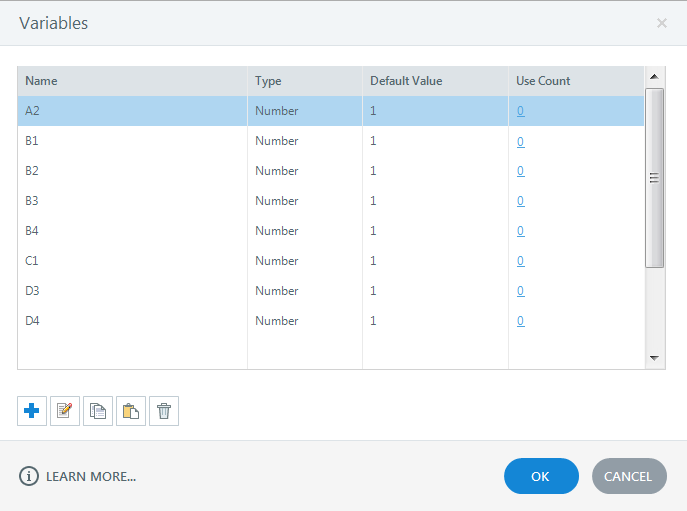 If you use that method, then all you have to do is select the appropriate variable from the drop-down menu. 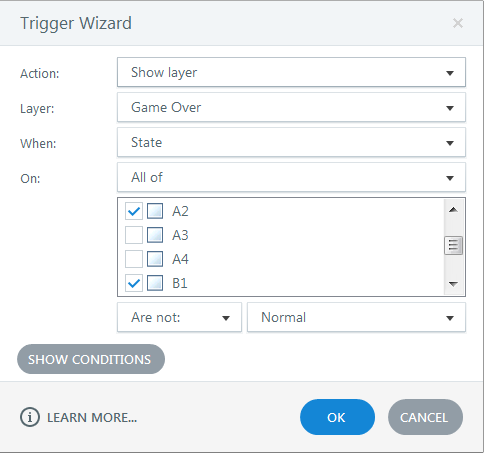 Once you’ve added all of the triggers, you’ll want to adjust the “jump to” trigger so that it takes the learner back to the gameboard. You’ll also want to make sure that this trigger is the last trigger in the list. 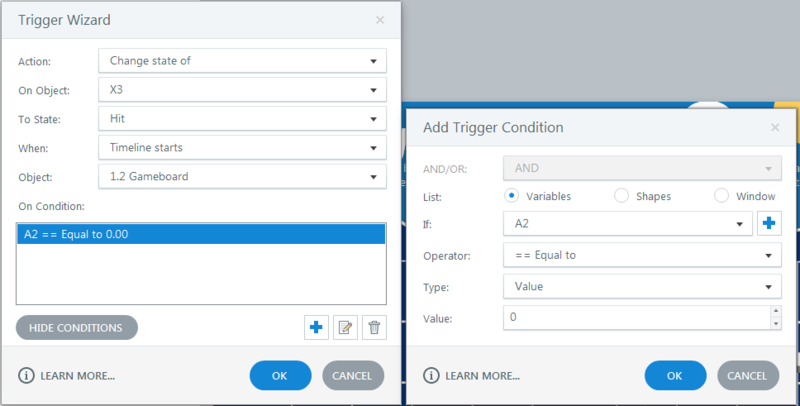 If it isn’t the last one in the list, the learner will be brought to the gameboard prematurely, before all of the variables are adjusted, as the triggers are executed in order from top to bottom. If that happens, the gameboard won’t be reset when they arrive. Now it’s time to add a layer on your gameboard to let learners know when they have found all of the enemy’s ships. On my layer, I’ve added a rectangle to cover the text on the base layer, some explanations and instructions for the learner, a button to take them to the results page, and an arrow to draw attention to the button. On my button, I’ve added a trigger to hide the layer and jump to the results slide when they click. That way, if they decide to try again, this layer will not appear when they return to the gameboard. Back on the base layer, add a slide trigger to show the layer when the states of all of the enemy squares with ships underneath are not equal to normal. That way, once the learner has clicked on all of them (meaning the states are now either hit or misfire), the “game over” layer will appear. Almost there! 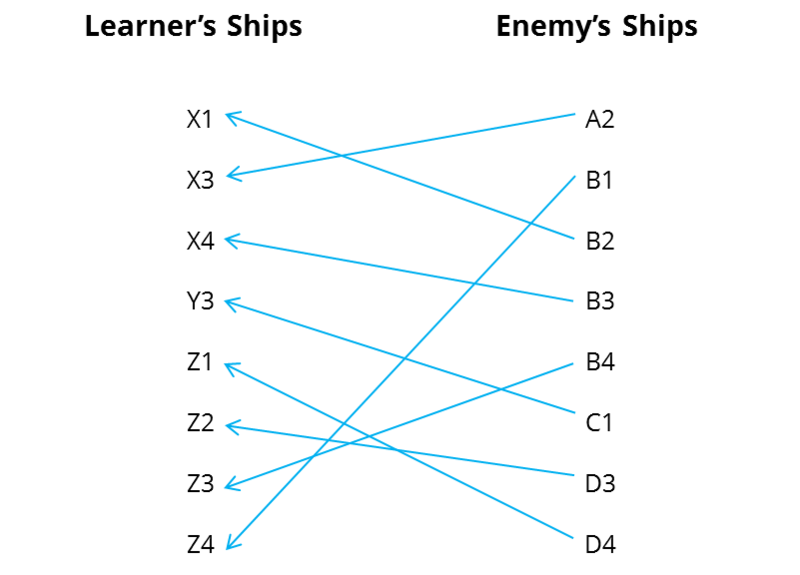 To force the enemy squares to reset, add a slide trigger changing the state of all of the enemy squares (with and without ships on them) and all of the learner squares with ships on them to normal if the value of the retry variable is equal to true. That way, if the learner decides to give it another try, the gameboard will be blank. 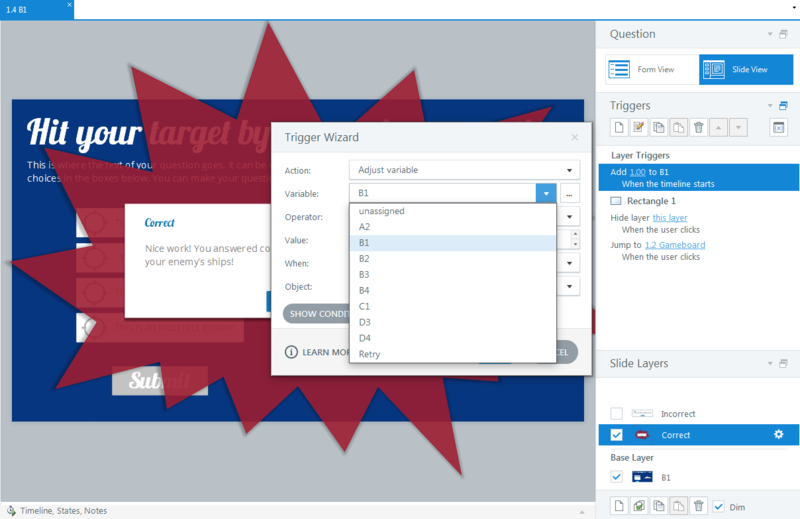 The last step is to add a slide trigger to change the retry variable back to false, so the gameboard doesn’t continue to reset itself each time the learner answers a question and comes back to the gameboard. 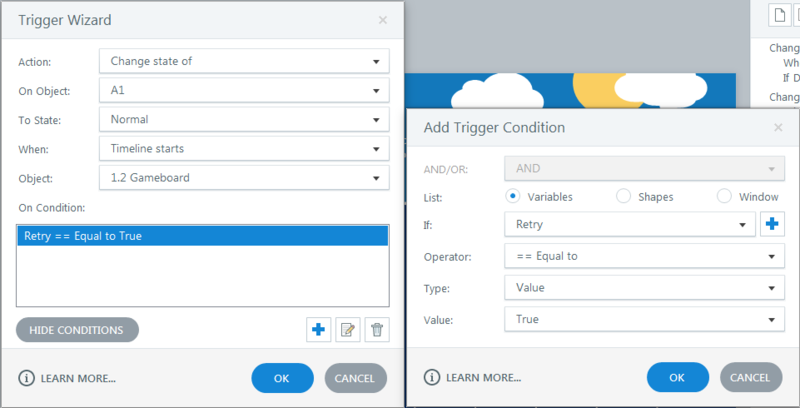 Make sure that this trigger is the last in the list of triggers, just before the list of object triggers. 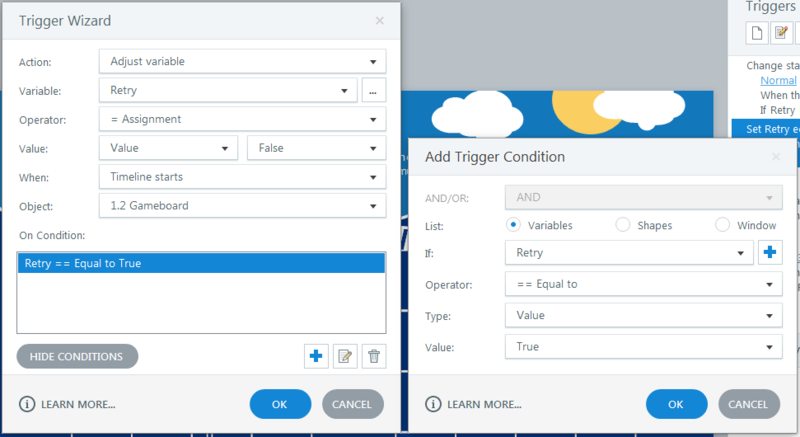 Otherwise, the value of the retry variable will be changed to false too early, and the board will not reset correctly. 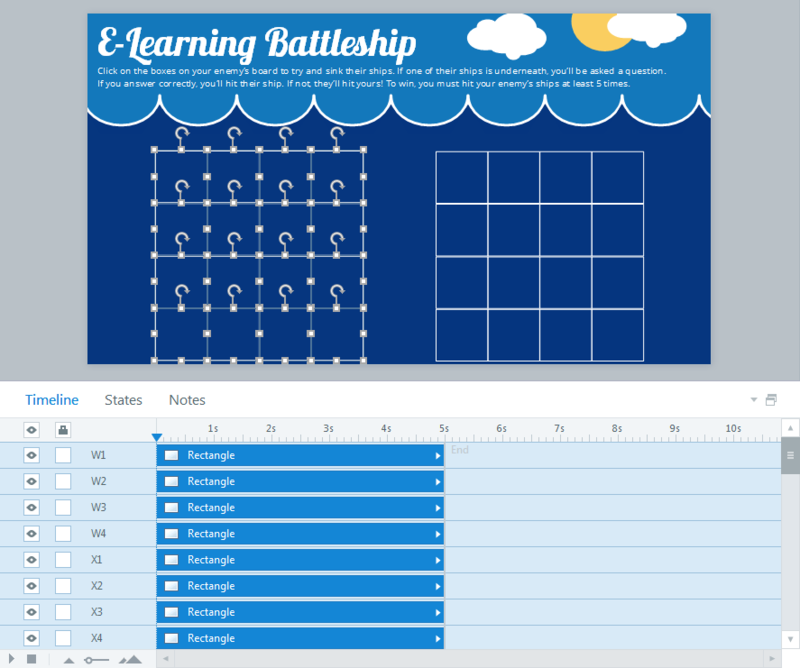 And there you have it: your very own e-learning battleship game! I hope you had as much fun creating it as I did. Pat yourself on the back; your learners are going to love it. If you liked this example but don’t have time to build it yourself, no problem! We’ve made it available for free: download here. Did this article light your fire for gamification? Check out this series of articles, examples, and downloads for all the gamification tips and inspiration you’ll ever need. Oops, looks like there was a copy/paste issue. The link is fixed! Thanks for pointing that out, Richard. It works now. Looks great. Thank you for the detailed post and explanation. This is awesome, Allison! Love it!!! This is awesome, Allison. 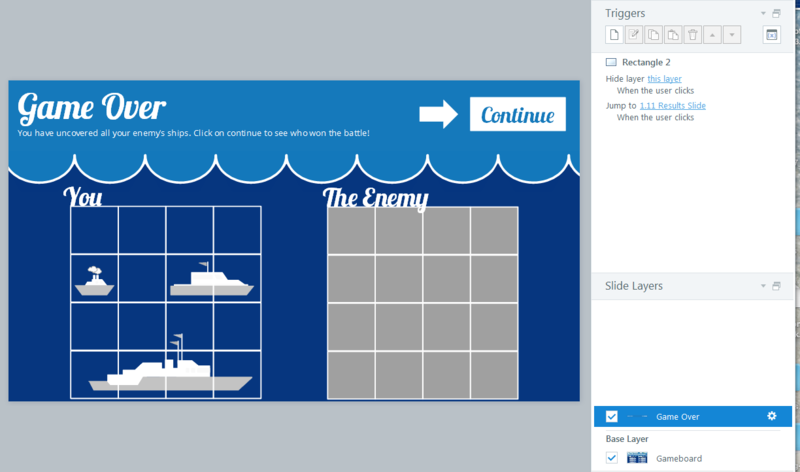 I absolutely love the graphics and idea implementing ship battle paper game to an e-learning course. Wow! This is really Awesome or I say "Blow my mind away". Good Job!! Awesome Allison, love the game and your tutorial, Thank you! You're welcome, Scott. Glad you like them! That's fantastic Allison, very creative. This is awesome!!! Great tutorial, thanks for sharing! WOW! Thanks Katarzyna! :) So glad you enjoyed it. This is super cool! Very nice! "Blown away" by your creativity and design...great work!! Just had the time to check this one out! Totally awesome. Great step-by-step description! Amazing. Thank you so much for giving the step-by-step directions. Even with those the project is overwhelming - and I can hardly wait to give it a try. Easy for you -difficult for me. J But I'll sure give it a try. You can do it! Let me know if you run into any issues. I'm coming across an issue. When I click a square that doesn't have an enemy ship, the Miss shape appears. Then, when I go to a question slide and come back, the squares that have been turned to the Miss state turn back to normal. Therefore, I only see the clicks where the enemy ships are. 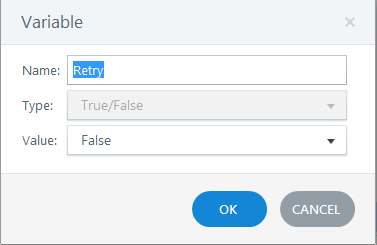 I've also verified that the Retry variable remains set at False. I'm having the same problem! 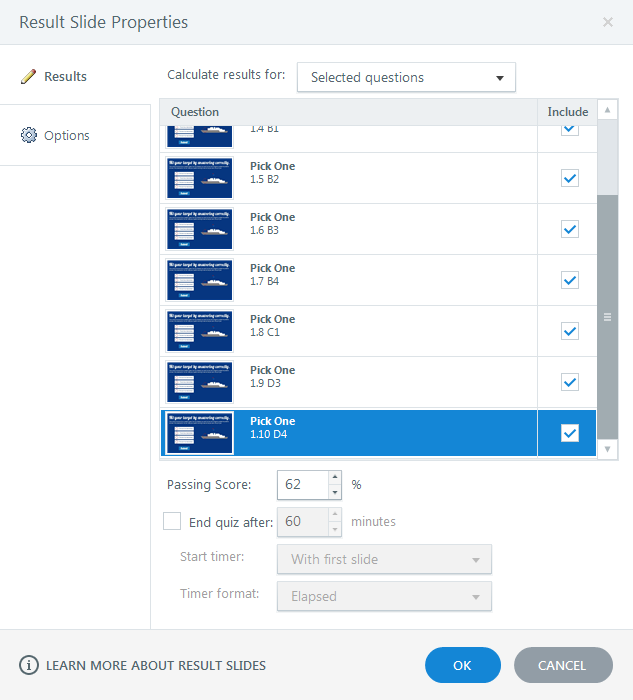 Also, when I complete one round and retry the quiz, I can't submit new answers - the original answers are still selected and can't be changed. It is as if the objects are resetting to normal state, but the questions aren't. 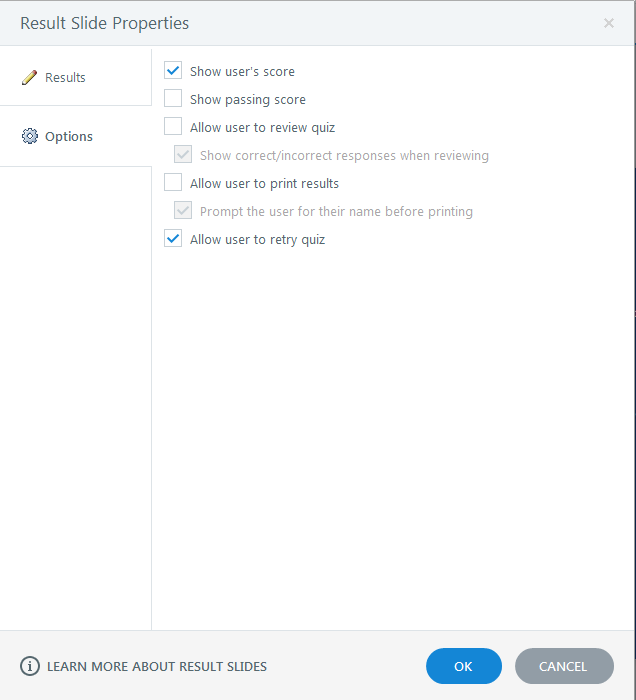 Did you check the "allow user to retry quiz" box on your results slide? That is what allows the questions to be reset. You'll also need to change the slide settings of the gameboard to "resume saved state". Byron's response below is correct. In the tutorial I forgot to note that you need to change the slide settings to "resume saved state". I will update the tutorial. Sorry about that! Thanks for helping out Byron! Thank you Allison and Byron both for all your help! Recreating this game was my first real attempt at working with Storyline (triggers and variables and conditions, oh my!) Setting the Gameboard slide to "Resume saved state" and the Results slide to "Reset to initial state" fixed both of my problems. Thanks again! Hi Allison - thanks for this tutorial, it is excellent. This is my first time designing a project using Storyline so probably not the best idea to replicate this game with my limited knowledge. I have adapted this game significantly to work with my 'Social Media' package. Everything is working spot on apart from 1 small snag. When a learner answers a question correctly and returns to the game board, the hit state is displayed as it should but the 'ship' behind the square does not appear. This is the same for all of the questions, you can complete the game and never see the 'ships' behind. Any help would be great! Hi Adam! Did you change the fill on your squares to "none" for your hit and miss states? That's the first thing that comes to mind that could explain why you're not seeing your ships. Let me know if that's not the issue.